Airbus Broughton have won the Huws Gray Alliance championship and are heading back to the Welsh Premier League. It has been a magnificent season for Airbus and their 4-0 home win against Holywell Town ensured they will be back in the top flight next season. 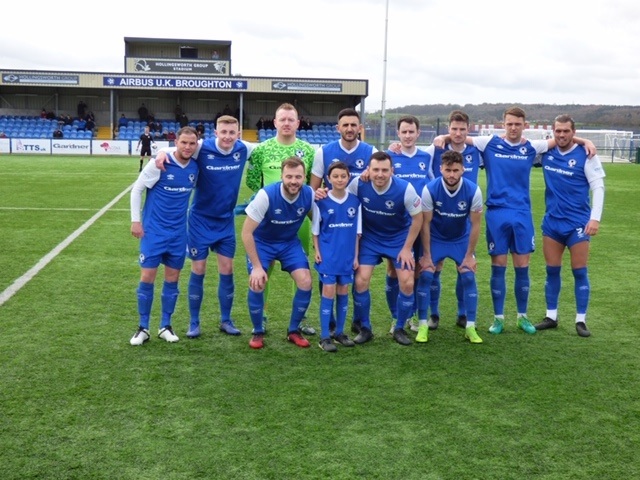 Asa Hamilton, who came through the Airbus youth development system and has also played for Penycae, Porthmadog, Rhayader Town, Buckley Town and Guilsfield, said: “What a bunch of boys. “Every one of us are best pals and stick together with everything and that’s what makes winning the league with theses boys so special. Champagne delight. Airbus Broughton celebrate their title and promotion. Airbus have earned their place in the JD Sports welsh Premier, although officially they must wait to see if their tier one licence application has been successful. Hamilton, James Hooper, Kristian Platt and Nathan Woolfe scored for Airbus in their win against Holywell, while closest challengers Flint Town United lost against Buckley Town. The Wingmakers have won the Alliance title at their second attempt after being relegated from the Premier League in 2017. Manager Stephen O’Shaughnessy and his team won 4-0 against Holywell Town after scoring two goals in each half. Platt and Wolfe fired Airbus two goals ahead in the first seven minutes, while Hamilton and Hooper completed the scoring. Second-placed Flint Town United lost 2-1 at Buckley Town. Buckley lead at the break thanks to an Aron Williams goal and Jake Roberts made it 2-0 after 75 minutes. Richie Foulkes netted for Flint from the penalty spot two minutes from time, but the home team emerged winners. Porthmadog 4-0 at half-time in their home game against Gresford Athletic with Julian Williams (2), Gruff John Williams and Ifan Emlyn scoring. The start at Guilsfield was delayed due to the match officials being involved in a road accident. Guildfield and Rhyl fought out a goalless draw. Conwy Borough netted two early goals at home to Llanrhaeadr YM through Dean Seagar and Connor MacGonigle, Marc Griffiths pulled a goal back for YM before the break only for Sean Macaffery net Conwy’s third and seal the points halfway through the second half. The first half was goalless in the Ruthin Town v Penrhyncoch game before Ilan Hughes netted a penalty to open the scoring for Ruthi after 54 minutes. Ryan Jones sealed the points for Ruthin with a second goal after 68 minutes. Holyhead Hotspur won their bottom of the table at home to Denbigh Town. Mel McGuiness gave Hotspur the lead after 14 minutes, while Miles Todd headed the equaliser from a corner. The decisive third goal came on 68 minutes when John Littlewood scored to give Holyhead their second consecutive victory. Denbigh finished the game with 10 men when goalscorer Miles was booked for a second time. Prestatyn Town raced into a two-goal lead after 13 minutes against visitors Bangor City with Alex Jones and Danny Davies on target. Bangor hit back to make it all square at the break with player-manager Gary Taylor-Fletcher and Jacob Farleigh on target. Dave Hayes put Prestatyn 3-2 ahead after 68 minutes and they added three more with a second each for Davies and Hayes plus a goal from Macauley Taylor. Huws Gray Alliance results: Airbus Broughton 4, Holywell 0; Buckley Town 2, Flint Town United 1; Conwy Borough 3, Llanrhaeadr YM 1; Guilsfield 0, Rhyl 0; Porthmadog 0, Gresford Athletic 0; Ruthin Town 2, Penrhyncoch 0; Holyhead Hotspur 2, Denbigh Town 1.